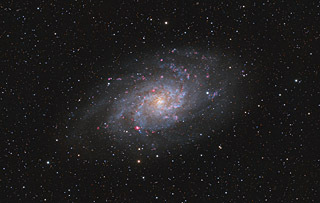 M33 is the third largest galaxy in our Local Group of galaxies which includes M31 (the Andromeda Galaxy), and our own Milky Way Galaxy. Visually, the galaxy is quite large - about 70' x 40'. This makes the galaxy a bit larger than the full moon. 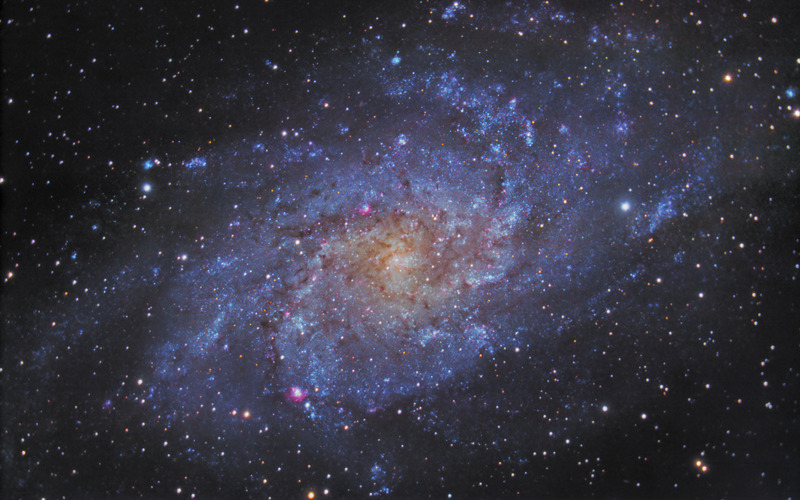 However, unlike the Full Moon, M33 has a very low surface brightness, so it is quite challenging to see as well as to photograph. Software Used Images Plus 4.0 for camera control, calibration, stacking and Digital Development and multiresolution smoothing. Photoshop CS5 used for flat fielding, curves, color correction, saturation adjustments, star shrinking, noise reduction and high pass filter. HLVG for additional color correction, Carboni Actions for additional saturation adjustments and noise reduction. Notes I had an extremely difficult time processing this image to my satisfaction. Ultimately, I processed it a total of 7 times before I was happy with the color balance, detail, and saturation. In this final image, I am very pleased with the detail I was able to bring out, as the image is quite sharp and can be enlarged a great deal to see many individual stars (which are 3 million light years away!) and it still retained good faint detail in the outer regions. Some day I may try to add some Ha data and capture the star formation regions even better.